Rodeos, hayrides and country dances are just a few of the tailor-made events calling for western outfits, but finding plus size western wear is not always easy. If you are a full-figured country gal in need of new duds or just want to add some chic country flair to your ensembles, shopping western wear specialty retailers for essential western themed items will help you create a style that's uniquely you. When you want hard-working, durable western wear, Wrangler is a great option. You can order directly from Wrangler.com or use the store locator on the website to find a retailer that carries the brand in your area. Reviewers on Bizrate give Wrangler.com high marks on criteria such as likelihood to recommend, overall satisfaction, and shopper loyalty. Free spirited cowgirls love being decked out in tops from The Rock 47®by Wrangler®Collection, which contains a small group of plus sized tops in sizes XL and XXL. The main styles are crew neck tee shirts and long sleeve blouses in western themed prints, patterns and solids. Prices range from just over $30 to around $60. Wrangler offers three styles of jeans for plus size women, which range in price from around $30 to $60. 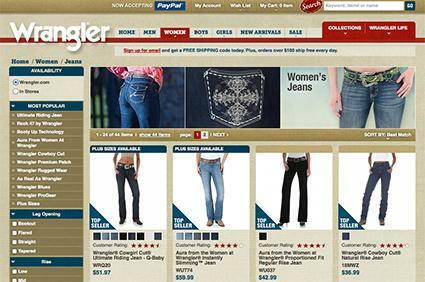 According to the Wrangler website, the first two styles listed above are top sellers. Standard shipping is free for orders over $100; flat rate shipping fees for orders $50 to $99.99 are $8.95 and $6.95 for orders under $50. Expedited service is available for an additional fee. First-time email subscribers receive a code for free shipping. Unwashed, unworn and unaltered garments can be returned within 60 days. WesternWear.com carries an average inventory of fashionable western wear for plus size women. Whether you are shopping for a simple embellished tee shirt or some new jeans to make you look slimmer and leaner, you'll find some quick fashion fixes to take your western wardrobe from dull to dazzling. Western Wear offers a limited inventory of plus size western tops ranging from size 1X to 3X. The styles are mostly 100% percent polyester, rhinestone-embellished tops with fashionable three-quarter length sleeves. There are a few short or sleeveless styles for variety. Brands represented include Jane Ashley, Lawman and Cowgirl Diamond. Women looking for top brand name plus size jeans will find an abundant supply at Western Wear. Brands include Wrangler®, Grace in LA, and Levi's. Their biggest plus size selection is in the Wrangler®/Silver brand. Sizes range from OW to 17W. Choose from light, medium or dark wash denim in flattering bootcut leg silhouettes. Prices range from $36 to $86. 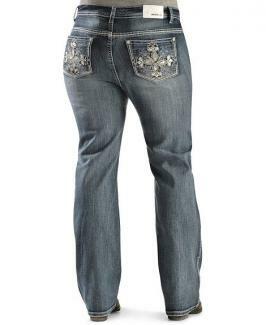 Customer reviewers described these jeans as best for riding and fit, perfect fit, and super comfortable. They have a smaller selection of plus size styles in the Grace in LA brand, with sizes ranging from 17 to 21. Prices range from around $60 to $80. All styles are available in dark wash denim with boot cut leg openings and embellished back pockets. Embellishments range from Aztec-inspired themes to floral to winged cross designs. Customers who purchased these jeans raved about their great fit. The representation for Levi's is limited to five styles in black denim, indigo rinse, dark wash denim, and iconic denim. Prices for all styles are under $40. These boot-cut jeans range in size from 18 to 24. Standard shipping is free for orders over $99. Shipping varies for purchases under $99. Some items, such as Levis jeans, can only be shipped to the United States. Returns are accepted for up to 90 days from date of purchase for unworn, unwashed and unaltered clothing with tags attached and returned in the original packaging. Boots cannot be returned. Sheplers carries a large variety of plus size western garments like tops and jackets. Most styles fall in the $30 to $100 range, though some cost more. Shop online or use the store locator to find the store nearest you. Sheplers carries Red Ranch, Cowgirls and Diamonds, Gibson Trading Co., Lawman, and Jane Ashley plus size tops. Most tops are screen-printed t-shirts with long or three-quarter length sleeves or plaid and print fabric with a few fringe-embellished styles. Prices range from under $15 to around $33. Sizes range from 1X to 3X. Sheplers offers a limited inventory of plus size leather jackets from Liberty Wear in sizes 2X and 3X. There are two styles and both are special order items: Black Fringe Leather Jackets and Bone Bead and Fringe Leather Jackets. The jackets feature embellishments like bone beading or silver tone accent studs and flattering princess seams that can make you look taller and slimmer. Prices range from around $180 to $240. Shipping is free on orders over $99 and unworn items can be returned within 90 days. Special order items such as leather coats may incur a restocking fee if returned. Subscribe to their emails for alerts about store and internet sales and special offers. Western boots are a cowgirl tradition and never go out of fashion. No self-respecting cowgirl would head out to a hayride, go horseback riding, or attend a county fair without slipping on her favorite boots. However, finding boots to fit the larger calf sizes of plus size women can be challenging unless you patronize a merchant like Shoebuy that carries wide width boots. 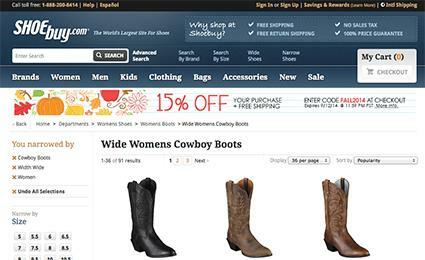 Shoebuy carries a nice selection of wide width cowboy boots in from Ariat and Lucchese Since 1883. Most of the Ariat boots they carry in wide widths feature heel heights of 1-12/ to 2-5/8 inches and prices range from $100 to $300. With the exception of the Houston, the boots have rubber outsoles and full grain leather uppers. The Houston has a leather outsole and a full grain leather upper. Customers who bought Ariat boots remarked they are perfect for wide calves and very comfortable. Their inventory of wide with Lucchese Since 1883 boots is mostly in the 1-1/2 to 2-5/8 inch heel range with pricing from $300 to $500. Special features include contrast stitching or embellishments like studded heels, fringe and distressed leather. Site reviewers praised these boots for the softness of the leather but most felt the sizing was a little narrow. Depending on the brand, wide width sizes range from 5-1/2C to 13C. Ariat carries one style, the Houston, in sizes 10.5, 11, and 13 in a D width. Across all brands, pricing ranges from around $65 to $1,000. Shoebuy offers free shipping on purchases and returns and a 100% price guarantees. You can sign up for free size and width alerts so you'll know when the items you want are available. Email subscribers receive updates about sneak previews and special sales. To earn points to redeem for discount coupons good on future purchases, register for Shoebuy Rewards. Western Cowgirl carries a nice selection of western themed accessories, including fashion belts in sizes to fit full figures. Their plus size belt sizes range from 2X to 5X. They are made of leather and embellished with crystals and rhinestones to add just the right amount of bling to any outfit. Prices range from $45 to $70. Orders of $100 or more ship for free. Return unused items within 30 days for refund, exchange or store credit. New email subscribers receive a discount code for their first order and notifications of future sales and discounts. 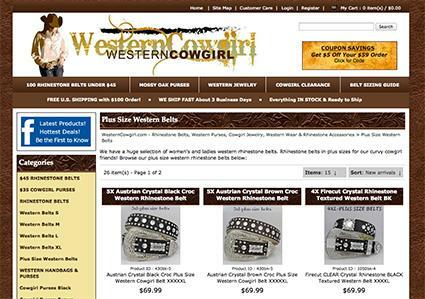 It's A Cowgirl Thing stocks a small but glittering inventory of plus size belts in sizes 2X and 3X. Prices range from $43 to $80. The durable leather belts are adorned with western themed ornamentations like rhinestone crosses, pistols and spurs. Items ship by USPS Priority Mail with rates determined by the location, size and weight of the order. Unworn items in the original packaging are returnable, subject to a 10% restocking fee. As with any clothing purchase, make sure the garments fit before you commit to buying them. If you purchase items online, check out return policies, especially if you are purchasing from a merchant for the first time. It might be wise to order one or two garments as test items to make sure the fit runs true to size. When buying jeans, allow a little room for shrinkage when washing. Pay attention to small details like these, and you'll enjoy the fit and look of all your new western wear.